These charts help pick out what swim lessons are perfect for you &/or your participant. They include skills that need to be completed before they are allowed to progress onto the next level. These charts also show the Program Overview and the Stages of Learning in our lesson program. Of course, if you still have questions after looking these forms over, you are more than welcome to give us a call at (217) 287-7271. Have you always wanted to learn to swim? Do you wish you obtained more confidence in the water? Does our lessons schedule just not work with your schedule? No matter the reason, the age, or the skill, the time is always right to learn to swim! Our 30 minute Private Lessons are available to those who wish to improve their technique through individualized lessons. These are available year round and can be scheduled by contacting our Aquatics Coordinator at (217) 287-7271. The Swim Starters YMCA Swim Lessons Program is divided into two levels; Level A: Water Discovery – Introduces infants and toddlers to the aquatic environment. Level B: Water Exploration – Focuses on exploring body positions, blowing bubbles and fundamental safety and aquatic skills. Parents accompany children in these levels, which introduce infants and toddlers to the aquatic environment through exploration and encourage them to enjoy themselves while learning about water. These levels will be taught for a total of 8 weeks, having one lesson each week. The Preschool YMCA Swim Lessons Program is divided into two divisions and six levels. 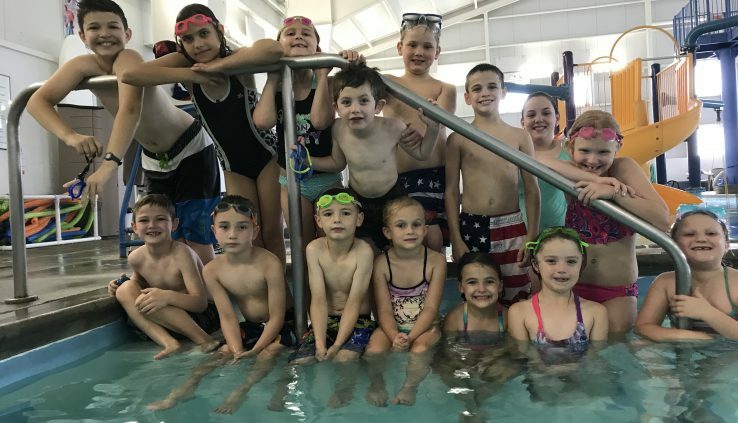 The first division is Swim Basics; Swimmers develop a high level of comfort in the water by practicing safe water habits, engaging in underwater exploration, and learning how to swim to safety and exit. All lessons last for 8 weeks, meeting once per week, ending with 8 total lessons. Students develop comfort with underwater exploration and learn to safely exit in the event of falling into a body of water in stage 1. This stage lays the foundation that allows for a student’s future progress in swimming. Preschool is for ages 3-5. In this level, students focus on body position and control, directional change, and forward movement in the water while also continuing to practice how to safely exit in the event of falling into a body of water. Preschool is for ages 3-5. In this level, students learn how to swim to safety from a longer distance than in previous stages in the event of falling into a body of water. This stage also introduces rhythmic breathing and integrated arm and leg action. Students in this level develop stroke technique in front crawl and back crawl and learn the breaststroke kick and butterfly kick. Water safety is reinforced through treading water and elementary backstroke. The Youth YMCA Swim Lessons Program is divided into two divisions and six levels. The first division is Swim Basics; Swimmers develop a high level of comfort in the water by practicing safe water habits, engaging in underwater exploration, and learning how to swim to safety and exit. At this level, students focus on body position and control, directional change, and forward movement in the water while also continuing to practice how to safely exit in the event of falling into a body of water. At this level, students learn how to swim to safety from a longer distance than in previous stages also introduces rhythmic breathing and integrated arm and leg action. Students in this level work on stroke technique and learn all major competitive strokes. The emphasis on water safety continues through treading water and sidestroke. In this level, students refine stroke technique on all major competitive stroke, learn about competitive swimming, and discover how to incorporate swimming into a healthy lifestyle. This stroke clinic focuses on fixing your current technique, helps with swimming the stroke correctly, and helps you pass the lifeguard prerequisites. The Stroke Clinics will help you correct your bad habits and enable you to swim with more confidence. Within each clinic, proper arm, leg, body position, and turns will be addressed. For those in competitive swimming, these clinics will give you the knowledge to know what is a legal stroke and what movements will cause you to become disqualified from a race. This class was started in September of 2017 to help the Swim Team participants get their strokes corrected, and it eventually evolved into a Pre-Lifeguard class in January for our adults. This program was also ran the winter of 2018; January, February, and March. The adult swim meets that we attend annually is in April if you are interested in joining the Swim Team. Depending on the number of participants, the program could eventually evolve into a Pre-Swim Team Class.